We have no food issues! The folks in Fort Plain have fed us so well that the Lois is riding at least an inch lower in the canal! 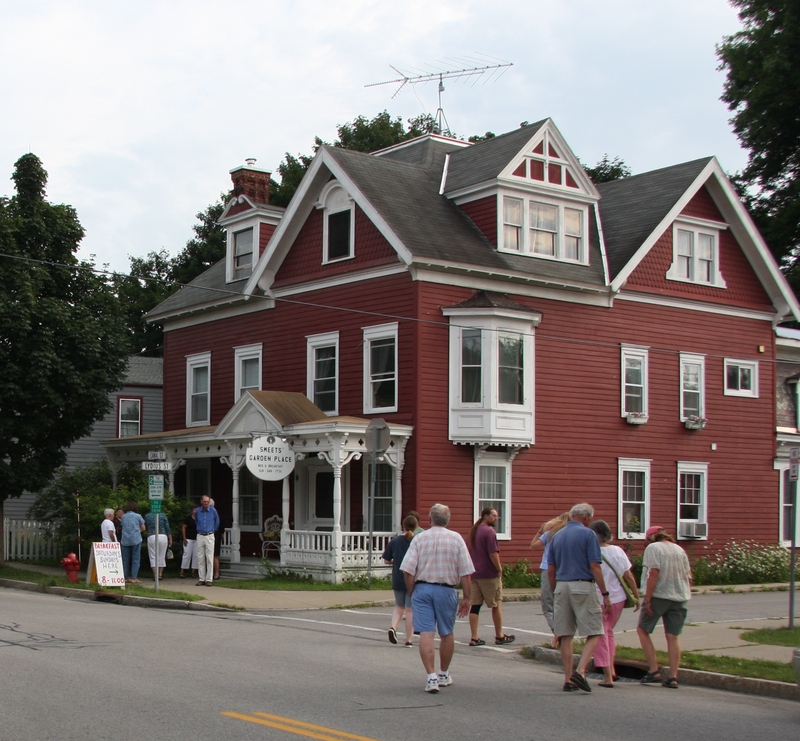 On Monday evening, we were led on a short walking tour of the town that ended at Sweet’s Garden Place, a fantastic bed and breakfast in downtown Fort Plain. There, we were greeted by a host of smiling faces and an incredible buffet. There was pulled pork, cooked with love and care for hours and hours, sweet corn from a local farm, the famous Fort Plain Museum Militia Beans, and not-your-ordinary cole slaw. For dessert—incredible, warm, peach cobbler. We made our way back to the schooner along Fort Plains’ bike trail, already feeling awfully good about this town. At 7:30 Tuesday morning, we followed the bike trail back to Canal Street and Sweet’s. Lindy and Larry, the owners, had invited us for breakfast. Little did we know that we had another huge treat in store. French toast, eggs (Barb says Larry makes the best scrambled eggs she’s ever had), bacon, sausage, homemade coffee cakes, and flapjacks—the Sweets insist that they not be called pancakes—but whichever, they’re the best I’ve ever eaten. Come late afternoon, the crew was invited to the town barbecue in the park next to our mooring place. Let’s see: hot dogs, cheeseburgers, grilled veggies, watermelon, homemade cookies, and giant plates of fudge ripple ice cream. It was very hot during our stay in Fort Plain, and the demand for cold water, cold juice, cold soda, cold seltzer (seltzer donated by Hannaford) was unceasing. Thanks to VFW Post 3275, we had bags and bags of ice to keep those drinks—and us—cool. So, that’s it, right? Nope. The Sweet’s hosted yet another breakfast, and our Tom, having heard all the praise of the flapjacks the day before, dug in for ten, yes, 10—!!! What made all of these meals special, in addition to the great food, was that we were joined at table by the townsfolk who were are hosts. There was good conversation and more than a few good laughs. We made many new friends in Fort Plain, and we left this morning feeling not just fed, but nurtured. Thank you all!